Two or three times a week, a physician contacts me, in search of executive coaching. Department chairs, managing partners, medical directors, chiefs of staff—they’re all frustrated. 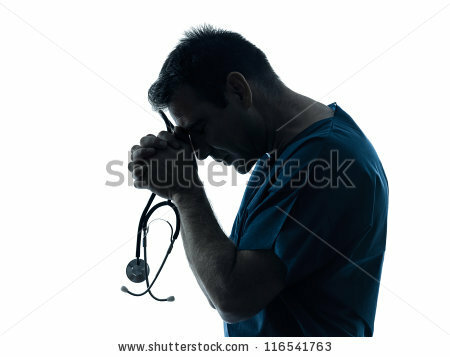 As a practicing physician with experience in several leadership roles, I know how they feel: They don’t recall saying to their childhood friends, “I want to be Vice President of Medical Affairs when I grow up.” Rather, they longed to care for people, to earn a good living, and to make a dent in the world’s suffering. They wanted to be doctors. However, at some point that wasn’t enough. They found they also possessed a desire to improve their organizations. They stepped forward, spoke up, and became leaders. Now they need help getting things done. They know they are on the cusp of revolutionary change in health care—and it is they who will make it happen. But they feel underqualified to lead. In medical school, they trained to treat pneumonia. They didn’t learn how to steer employees through a corporate matrix to meet organizational goals and hit budget targets. Here are four of the biggest challenges they face, along with some solutions that I’ve seen work for them. Challenge #1: They feel overwhelmed by organizational noise. Physician leaders have a cacophony of goals and demands ringing in their ears. They understand the need to transform care models and move toward value-based, patient-driven systems, but they also feel intense pressure to deliver revenue and improve cash flow. Meanwhile, their clinical responsibilities don’t let up. So they have trouble deciding where to focus their efforts. A CMO of a large health plan felt this way. He spent his days putting out fires rather than making strategic decisions with lasting impact. His task list steadily grew. He wasn’t exercising, he’d developed high blood pressure, and he’d become irritable with his family. He considered leaving his executive post for a clinical one in a quiet urgent care facility. Solution: Start with simple changes that make a big difference. In our initial coaching sessions, the CMO and I focused on ways he could immediately regain control of his schedule: working more effectively with his executive assistant, prioritizing his long to-do list to free him up for strategic thinking, and blocking off time for exercise and family. These efforts quickly paid off, renewing his sense of self-efficacy and instilling a new passion for his leadership role. Challenge #2: They feel like outsiders. Many physician executives find themselves betwixt and between: Fellow clinicians think of them as “suits” and regard them with suspicion, while other executives see them primarily as doctors. In advocating for the interests of one side, they inadvertently annoy or betray the other. That’s what happened to a medical director of an accountable care organization. She agitated a large group of oncologists by saying they should cut back on prescriptions for an expensive medication. It was one of many edicts she had issued, and they took offense, openly discussing the difficulties of working with her versus the friendliness of a local competitor. Solution: Ask more than tell. During coaching, through role playing and conversational recall, she realized that she had projected a voice of authority, not one of collegial intent—and that’s what rankled her colleagues. With some guidance, she used open questions (such as “How would you…?” and “In what way could we…?”) to better understand their clinical perspective. The oncologists responded collaboratively, working with her to create protocols that yielded savings andbetter outcomes. Challenge #3: They feel stuck in transition. 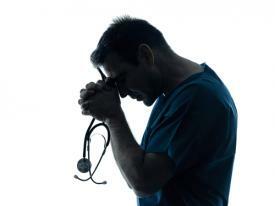 The metamorphosis from bedside physician to leader is not easy. The traits that make doctors top-notch clinicians don’t always motivate others to do their best work. For example, the orthopedist who excels at meticulously re-assembling tiny shattered bone fragments may find herself at odds with her employees if she attempts to manage them with the same eye for detail and compulsion for control. Solution: Build complementary teams. No leader can do it all alone. When coaching physician executives, I help them identify their strengths as leaders and build complementary teams to shore up their weaknesses. Here’s an example: A managing partner of a large hospitalist medicine group lamented that partnership meetings had grown increasingly meandering and unproductive. A personality profile assessment at the outset of our coaching engagement gave him insight into his subjective, visionary decision-making style. In response, he assembled a small team of partners with more objective, detail-oriented styles to help him weigh options before presenting ideas to the larger group. After that, partnership meetings became much more focused. Challenge #4: They feel trapped in a time warp. In “clinical time,” you see a patient and either perform a procedure or prescribe treatment—and then quickly move on, usually within hours. But in “business time,” it can take months to solve a problem—to change a process, for instance. As proposals work their way up and down the organization, they’re discussed, tweaked, and discussed some more. Rarely does someone simply decide on a fix and make it happen. Solution: Break large goals into smaller ones. In a coaching session, the chief of surgery at a large hospital talked about her struggle to change the privileging process for a cutting-edge endovascular procedure. I worked with her to reframe the larger goal as several smaller goals, around which she rallied key individuals and subcommittees over the next several months. Each incremental approval felt to her and others in the organization like a small win, setting the stage for ultimate approval by the medical executive committee. Physician executives know they need to grow in all these areas. They attend courses on negotiation and organizational behavior, get input from members of their networks, and read voraciously. However, when they head back into the stormy sea of e-mails, meetings, and deadlines, they can lose sight of what they’ve learned. That’s where coaching comes in. The solutions I’ve described certainly aren’t exclusive to coaching—you’ll find them in a variety of readily available sources, including blog posts like this. But coaching helps them stick. Whether it’s provided by a consultant or a colleague, it gives physician leaders a chance to practice and fine-tune their newly acquired skills and knowledge. It allows them time to explore leadership as a medical art—and that’s what it will take to make a dent in the world’s suffering, as they’ve wanted to since they were kids.